Troubled technology company Blackberry (BB), the mobile phone maker that transitioned into a software firm amidst continuing losses, improved its fiscal position in the fourth quarter. The better than predicted results triggered a rally and the stock gained more than 6% in early trading on Wednesday. But the stock lost its momentum slightly and was trading flat during the morning session. Indicating a full-fledged turnaround in the near term, the company headquartered in Waterloo, Ontario, returned to the positive territory after reporting losses consecutively for several quarters. Fourth quarter profit, excluding special items, came in at $0.05 per share and eclipsed Street expectations, a trend that is continuing for the past 14 quarters. On an unadjusted basis, the net loss thinned to $0.06 per share from $0.10 per share a year earlier as lower costs lifted gross margin to a record 76%. 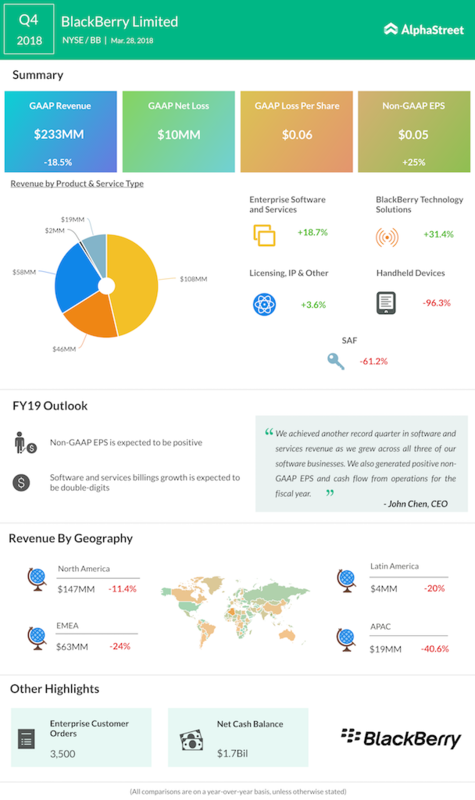 Despite a record growth in software and services revenue, overall revenues dropped about 19% annually to $233 million, but the rate of decline was smaller than expected. During the three-month period, the company launched BlackBerry Jarvis, a binary static analysis SaaS for automakers. In a clear sign of returning to profitability, Blackberry recently revamped its Radar partnership with Fleet Complete and forged a new tie-up with Pana-Pacific to extend the availability of Radar, in addition to a number of other partnerships and product announcements. The company had changed its focus on building itself as a software service company ever since the Blackberry smartphone lost its clientele to Apple’s (AAPL) iPhone and the new-generation Android handsets. Encouraged by the positive results, the management targets a double-figure growth for software and services revenues in fiscal 2019 and expects the rebound in earnings and cash flow to continue this year, on an adjusted basis.